To love or to abuse a robot? We put the Pleo dinosaur to the test, giving it two alternative upbringings. In his 1950 short story "There will come soft rains", Ray Bradbury's vision of the house of the future set the tone for how technology and robotics would automate our drudgery. Breakfast was made, washing up done, robotic mice cleaned the floor - the whole house alive and automatic (even if its human inhabitants, alas, are dead). With the possible exception of the robotic vacuum cleaner Roomba in place of the mice, this vision of a tech-enabled house has set us up to be disappointed. Instead, most of us are still struggling to integrate computer-based digital media with our home stereos and HD televisions. In years past, the "wired home" vision has focused on this kind of technology, integrating all of our audio/video devices with a centralised system for climate control and security. More than that though are the products that seek to change the way we use and interact with the internet at home. Recently, for example, iconic UK publisher Ladybird joined forces with Violet, whose technology taps into one of the more powerful ideas in the march toward smart homes. Violet first broke onto the scene with its Nabaztag - "the internet-connected rabbit" - as a means to get our information without staring at a screen. Now, Nabaztag can read out Ladybird books thanks to a new collaboration. A runaway success, the rabbit is connected through the home network and can access news, traffic reports, and stock updates, reading them out at times specified by the user. Rabbits can be "married", connecting them through the internet so that interacting with one makes the other respond. Part of Nabaztag's success, and central to Violet's new "mirror" offering, is the use of radio frequency identification or RFID tags. The cost and size of these tags, which provide a digital identity and a little electronic beacon broadcasting it, have plummeted since the tags were first developed. Violet wants to take advantage of the opportunity to tag everyday objects, and assign them with given tasks. It is one of the first commercial offerings to bring about the so-called "internet of things". For Violet's co-founder Rafi Haladjian, the idea is all about connectedness. "There's no reason to have just a few blessed objects that do the connecting," Haldjian says. "We want to create technology and services that let everything be connected." To do that, Violet has created an RFID reader that looks like a mirror and Ztamps, RFID tags about the size of a postage stamp. Pass your Ztamped umbrella over the reader at your computer, for instance and up pops a weather forecast, letting you know whether to take it with you. 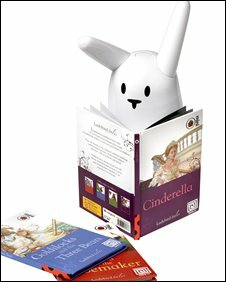 The collaboration with Ladybird allows for Ztamped books; flash a book in front of Nabaztag, and he (or she) accesses the internet, downloads the text, and can read out the book. Pause mid-story and the rabbit will remember where you left off. As of this month, Nabaztags are being sold with three children's books, with many more to come. In a similar vein, Alcatel-Lucent recently announced tikitag, a project that aims to see the same kind of ubiquitous tagging, with a view to making use of RFID-reading phones. A movie poster might, with a swipe of your phone in front of it, bring up the movie's website, or a painting in a gallery might call up a webpage about the artist. While the idea for such schemes has been around for a while, both Violet and Alcatel-Lucent are providing a platform for people to develop their own applications and make them freely available - time will tell what the wired community will do when everything can be tagged and connected. Futuristic visions of smart homes were always populated with genteel and helpful robots. Where are they? One recent trend toward our own mechanical Jeeves also makes the best of RFID tagging. A significant technological stumbling block for robots is object recognition, something that the human mind does with ease but is nightmarish to try to codify in software. Sidestepping that problem is to simply give everyday objects RFID tags, making identification a snap for robots. 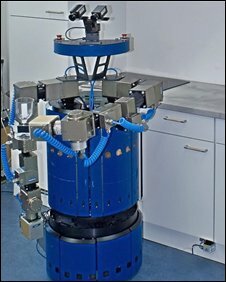 A German collaboration has developed a robot that gets a sense of what is in a household and where objects can be found by querying RFID readers in the cupboards. What's more, the robot learns the fundamentals of tasks simply by watching which objects move and how. Preparing breakfast, says Michael Beetz, the Technical University of Munich researcher who developed the idea, is characterised by the movements of plates from the cupboard to the table and then later, into the dishwasher. The "Assistive Kitchen" project will see internet connected robots learning the fundamentals of such tasks, and sharing their knowledge with each other online. This kind of decentralised knowledge is a step away from the traditional view of the all-knowing, cognizant robot, Beetz says. "If you make your robot able to read instructions off the web, it doesn't need such a huge knowledge base in itself." Such household-specific robotic projects abound in research labs; Stanford University boasts robots that grab you a beer or unload the dishwasher. Spin-off company Willow Garage is aiming to bring such handy robots into the homes of the elderly and disabled to help out. In futuristic visions of robots, they always had a personality of their own - a feature which isn't even addressed in Munich or at Stanford. A great deal of research particularly in Japan is going into the kinder, gentler side of robotics that will see our household helpers respond to us, and develop personalities. To get those most advanced robots integrated with the most socially developed software is still years off, but one hint of what's to come can be found in the form of Pleo. 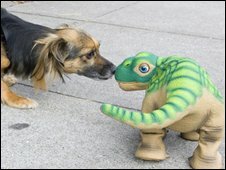 Pleo, from the American firm Ugobe, is a robot that looks - and moves - like a dinosaur. Ostensibly a toy, Pleo's makers refer to him as a life-form because he is loaded with sensors to tell him what is happening to him physically as well as about his environment. "If you look back in time, all of our assistive technology was biological: hunting dogs, horses, and so on," says John Sosoka, chief technology officer at Ugobe. "Because it's so natural for us to interact in that biological way, it's going to make a tremendous difference in acceptance if our technology can pick up on that. "If [our devices] exist in the physical world with lots of sensors they're going to be much better able to do that than the consumer electronics that we have now." That kind of flexibility, based on real-time sensory data, means programmers don't neet to account for all the different and dynamic physical environments that robots might encounter. More than that, it allows for the different personalities of the robots' owners; some might want a seen-but-not-heard helper to pick up after the kids, whereas an elderly user might want something more like a companion. So with all the elements of the house connected and responsive, there's no danger that Bradbury's particular vision could really come to pass. The house might even be sad to see us go.